In the "better late than never" news, I want to tell you that I quit my job. Like, six weeks ago. I know - can you believe I've been keeping it a secret? Well, not really...it just was a weird thing to come out with, especially when so many people are hurting for jobs. But this job was weird from the beginning, and what kept me going was my original boss and the people I worked with. Unfortunately the board of directors decided to fire my boss back in July '09 (actually they started trying to get him to resign around January of that year...oh you can imagine the tension in that place! ), and we were boss-less until this April. Two full-timers and two part-timers kept everything going - a public building, an art gallery, monthly receptions, grants, programming, even a little gift shop...and once we got the new boss, I had hoped that things would change with regard to my working on Saturdays. Nope. Instead, other hours were cut - where I had been able to work through my lunch, I had to take an hour off. And then my evening hours were cut. My paycheck, already small, was becoming ridiculous. And yet I was still having to work the one day that interfered with everything in my life - Saturday! So I revisited our monthly budget and figured out that we could live without my paycheck, and with Jeff's approval, gave my notice. The note pads and cards were from my coworkers (in a cute gift bag - I really appreciate prettily-wrapped gifts, having boys who have been known to wrap things in towels, lol); the necklace was from the president of the art league; the watercolor was from an artist who I've gotten to know over the years. Plus my coworkers had a little party with strawberry shortcake for me - sweet! You could have knocked me over with a feather on my last day at work, when I got gifts! And people called and came by to say goodbye - I really was shocked that people actually liked me enough to do that. Not to go all Sally Field on you, but it blew me away. I guess the shy, overweight girl is still thriving inside me. I don't know if she will ever fade away. You know how things work out for a reason? Well, back in August I googled "running clubs" for my area and found my club. Which meets on Saturdays. First day they met? The first Saturday I had off after leaving my job. And remember when we took our sons to Louisiana for some gambling? That same weekend. Where, if you recall, I hit the jackpot and won $500. It was like the universe was telling me that this was a good decision. Now, have I won any money since then? No...but then I haven't been gambling, either. And I won't be...I'm sane enough to know that that was a wonderful, bizarre coincidence and odds are won't be happening again anytime soon. But it was a good start to this next phase in my life, that's for sure! So besides running like crazy, not shopping (I seriously don't know how TJ Ross is staying in business!) and making Paco extremely happy by being home with him every day, I'm trying to write more - specifically my story. Some weeks are better than others with the writing...I'm finding that it takes discipline along with inspiration. So we'll see what happens with that - I figure I might as well try, right? Hey Lady! Let me in!!! Showing off his trim tummy! If you click on the pictures, you can see that he's got an acorn in his mouth. Our oak trees have been really prolific this season and the squirrels are getting quite the stash for winter! The backyard is also home to two other squirrels whom I've named Chip and Dale - they are always chasing each other round and round the tree - so fun to watch, but they move too fast to get anything but a blur when I take a picture. That football game we went to last Friday night? The Crosstown Showdown? Awesome game. We won, although it was close - 35 - 28. The really cool thing was that this win made it the 200th win for our coach - he is a really nice man and it was great to see him get this at such an important game. When my son broke his arm in the first football game of the season when he was in 7th grade and had to have emergency surgery at 2:00 am, this coach came to visit him; quite nice since he was the high school coach and my son was in middle school. But that's the kind of man he is. Jeff and I all decked out in maroon, cheering on our team! Ricky Bobby says "why so lazy, girl?" Danica was so impressed with Matt's run that she opted to show his splits! We had 35 minutes on the schedule. I was not enjoying this run - not one bit. Don't know why, exactly, except that some runs are like that. You can see that I stopped at 35 minutes, even though it wouldn't have killed me to run for an additional 30 seconds or so and get the full 3 miles in. But no. 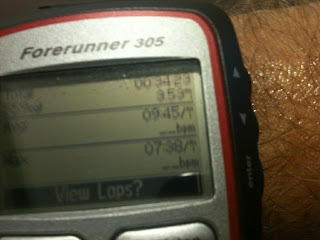 And I swear, if I hadn't set up to run with Matt that morning, I would have stayed in bed when my alarm went off. Having someone to be accountable to really helped me get moving. So thanks, long-distance running buddy! 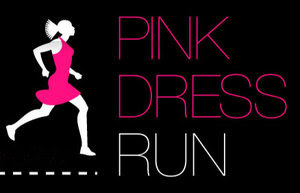 Speaking of running, Fran over in Holland is hosting a Virtual Pink Dress Run the weekend of October 30-31. This is a fun way for everyone in the world to get a run in and compete for some cute prizes, all in the name of breast cancer awareness. I'll be doing my run on Saturday, in Maui. And I will be wearing pink - yeah, pretty sure I own some pink running clothes! If you haven't already, join us - just click here to let her know! Fashion Friday is once again lacking, so I'll post a picture of me in my new favorite Nike shirt (and matching visor, lol) - posing with my post-nine-mile-reward of frozen yogurt. Alright, time to go carb up - we are running 10 miles tomorrow, so today will be all about the bagels and pasta for me...hope third time's the charm and my stomach cooperates after the run! Have a great weekend! You are a talented writer and I always enjoy reading your blog. I'll bet your book would be very interesting to read they say everyone has a story to tell:) Its harder to work from home than people would think lots of distractions. Good luck on your 10 miler tomorrow hopefully your stomach will cooperate. Good for you! I admire your decision to quit your job. I know that I stayed way to long after I knew things were bad at my old job. You are taking charge of your life! I am excited for you and your new direction. I love your writing and think you have an amazing story to tell. Love the shirt and the visor. The yogurt doesn't look half bad either. Good luck on your run tomorrow. Can't wait for a recap. "Some runs are like that." Never truer words spoken - lol! That Matt is a quickie isn't he? I'm in for the Pink Run. Unfortunately I will not be running in Hawaii. Have fun carbing it up today. I have always looked forward to that when I run long. Good for you! When I quit my last job, which was very unsatisfying, I found other things in life falling into place too. Sounds like this was absolutely the right choice for you. I might have to start running, just so I can carb load. I've got the will and desire to do it, but my knees and foot are screaming "STOP!" every time I think about it. So I'll put that in the "future" category. I have trouble writing my story too. I have reached a point in my writing where I know I need to put it away and come back again in a few months with fresh eyes. It's hard work. And yeah for running! And no jobs! Hope your tummy is better with the run tomorrow!! Ok first of all...WOO HOOO on your decision to leave your job. Sounds like you made the right decision AND are happy with it! Secondly...LOVE the shirt in your last picture.....where it says "the only way to finish something is to start". LOVE LOVE LOVE it! :o, Like the Nike t-shirt. Thanks for the shout out my sweet friend! I'd wish we could all run with you in Maui, that would be fun! You know I was wondering how you did combine the Saturday morning runs with your work but I didn't really think it through but now it all makes sense :) I think you made the right decision. Good for you that you did run that 35 minutes. I understand what you mean, I have those runs sometimes too. Well - if I need to have a secret kept, I know who to go to! Congrats on making a mental health decision. You are fortunate that you don't need that paycheck and now maybe you can find something that truly makes you happy until you sell that book deal. I love the nonchalant way you toss off doing a 10-mile run tomorrow. I think your squirrel is practicing YOGA! LOL! =D happy weekend! Oh Shelly, you need to work on realizing how wonderful you are. I've never met you, but if I had the pleasure of working with someone like you everyday, I'd certainly miss you. I'm glad things are working out with the decision. I'm sure it was a little scary at first. I love love love that shirt. I've looked on line and 2 stores and can't find it. Sigh. I won't give up. I love a shopping challenge. That's as profound as I'm going to get. You have guts, Girl! Go for your dream! I completely agree with you. Saturdays is not a day I can work on especially when having a family. Good work on the exercising. PEEKING IN FROM THE FLIP SIDE OF THE WEEKEND. back from my travels and ready to rock my week. How has the tummy been? Better on Saturday I hope. I'd be worried about that tree rat. He's got a scheming look in his eye. LOVE the new shirt. And the colors. That light bluw and pink make your eyes really stand out. Very nice. Love it! Congrats on your early retirement and I hope you are really enjoying your new found freedom! I am so happy for you. How thoughtful of your ex-coworkers as well. Lovely! 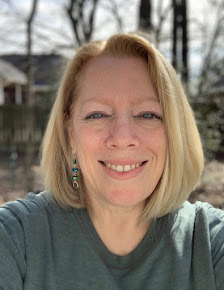 Whew, finally caught up with all my favorite bloggers and the posts I wanted to comment on; this is the last one (and oldest, LOL) in my web browser! I know you are already working, but I did want to say 'atta girl' for quitting your old job! I've been there, where you are just so miserable and there's nothing that can be done to fix it, and I made the same choice as you to quit. I don't regret it in the slightest, and I doubt you will either. Good for you for taking action!